Self Portraits - artists do them frequently. I have done a few. 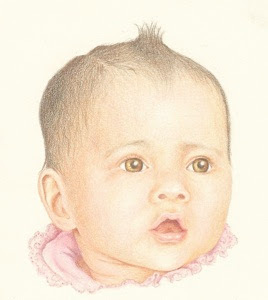 This one is colored pencil of me when I was a baby, not to be confused with one I did as a baby. (That would be talent!) Many portraits are a traditional head and shoulders view. Many aren't. They add things to represent more of what the person is like. So, if you were doing a self-portrait today what would it look like? Would you do only your face or your whole body? What would you be doing? Where would you be? What would be its mood? Would you add other elements? Things? Special objects? Would you add text? Would you add textural objects? What would you make it out of? These are just a few questions to get your mind going. If you're so inclined make one. If you had to capture you at this given time what would you do? You would be leaving a piece of your history. Think about it. I would have to say I like the thought of a child image rather then the current embodiment. I would have to ask my oldest sister and my mother for insight to as the look I was searching as to get it just right. It seems as an infant in the room I shared with my sister; I would in the night paint with the only thing a child had readily available. Only to have my sister wake to find me in the morning covered in my medium. This first sight is an image I would have liked to paint. You are an amazing artist! I love that portrait. I love pencil, color pencil is even better. Although I am horrible with color. I can do black and white better. If I were to do a self portrait it would definitely be of me when I was younger and thinner. I would probably do only a head and shoulder shot, maybe just the head. I would probably draw it in pencil because I don't do well with colors. I'd probably be just posing with a slight smile on my face. I seem to like those pictures of me best. I don't know that I would add textural objects. Jared - LOL, remembering well! Mashaide - I didn't know color at all until I took this colored pencil class at Provo Craft. This gal did so well teaching. You could totally get this I know. If I could do a self portrait, this statement pre-supposes that I have any artistic talent, I would paint a picture of me (how others see me) looking into a mirror, seeing what I see. The many flaws, the extra fat, the scars from surgeries, the wrinkles, the sun damage, the cellulite, and then in the upper right of the mirror the numbers of hours that I have logged looking into a mirror over the course of my life, next to the number of hours I have spent in the service of others, they would have to be real time and currently logging, that way, when I was tempted to look in the mirror and more seriously examine my flaws, I would see that number grow. I am not all vanity though, when I became a mother my service hours grew exponentially.